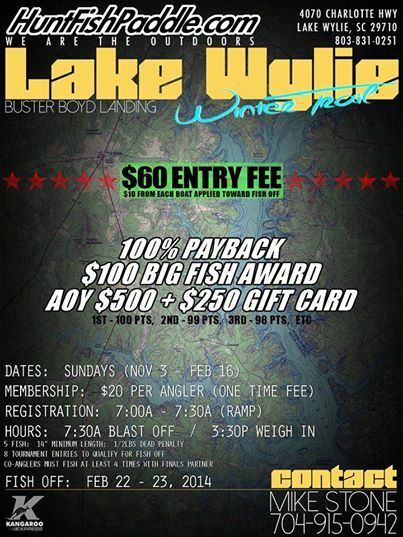 Hunt-Fish-Paddle is holding the Lake Wylie Winter Tournament Trail out of Buster Boyd Landing every Sunday through Feb 16th. Registration for each tournament is at the ramp from 7 to 7:30 a.m. the morning of the tournament, with blast-off at 7:30. Each tournament ends with a 3:30 weigh-in. There is a $60 entry fee, with 100% payback. A $100 big fish prize will be awarded at the end of each tournament, and an Angler of the Year package worth $750 will be awarded at the end of the trail. This is a 5-fish, 14-inch minimum, tournament format. To fish in upcoming tournaments, show up to register at the Buster Boyd landing at 7 a.m., or call Mike Stone at 704-915-0942.